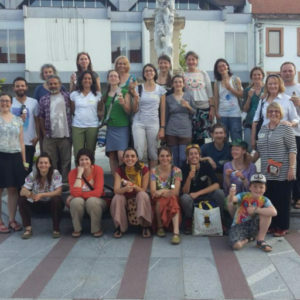 We are happy to announce that the CiP team and other participants have successfully finished the international course to train permaculture educators to introduce permaculture into schools and promote it as a community solution. The course was led by the authors of the book ‘Outdoor Classrooms: A Handbook for School Gardens’, Janet Millington and Carolyn Nuttall. Participants from 12 European countries were learning how to implement outdoor classrooms into kindergartens, schools and other areas where children are involved. Because nowadays the world is full of distractions, the question we need to ask is how do we get children back to the basic truth. Truth and knowledge that form wisdom that enables us to work in the world. The truth that lies in nature. The course was leading us through concepts and the benefits of outdoor classrooms; links with the curriculum; leading sessions with children, teachers or teacher trainers; designing with children; real examples of school gardens; managing children’s behavior in the outdoors; and practical workshops. It was a good mixture of theoretical and experiential learning. As the course took place in a local school which a permaculture teacher has been working in, we we had a very valuable experience working with local school and kindergarten teachers on their real teaching issues. On the final day we visited another school which has a very positive attitude to educating children outdoors with their own sheep, outdoor classroom, parkland and gardens. Two course participants (one adult and one child) seized the opportunity to lead a session with local children in nature connection activities. We now have many new tools, experiences and knowledge, to work with it in the future. The training was a great mixture of getting knowledge from Janet and Carolyn, from other participants of the group and finding some forgotten knowledge and experiences within ourselves. We are filled with motivation, new knowledge and skills and ready to share it with you!